Posted in: Monthly Updates, Weekly Post. Tagged: house. For those of you who don’t know, we are currently in the process of buying a house! We should close on Wednesday. Also, our internet provider went out of business. We used Clear which actually ran off Sprint cell towers, one of which is at the hospital right next to us so we got some awesome speeds. But Sprint has decided to close down access to them so they shut down November 6th. We have been without internet at home since then because we plan on moving at the end of this month. Anywho, enough about our personal life, here are the numbers! 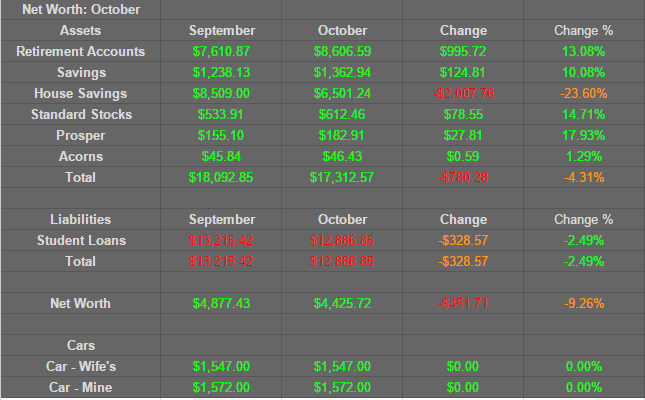 Not too much has changed other than our House Savings which will be down to $0 come next month. I will be adding the house to this next month. Excited for that! Until next time!